Hi all! Just a few more new rleases for your Halloween season! Also Halloween FREEBIES in shop…one for male, one for female. Also, the Lucky Lanterns will be rolling around the shop this week…find one with your inital…the prize is yours! Prizes will be changed daily! Per the Halloween season, I’ve recreated a simple jewelry set….Dark Bat…the bat has a jewel encrusted belly, on a chain necklace. Matching earrings are part of the set. More Halloween clothing…a set of tank tops and jeans, each available seperately. These items are available only thru Sunday, at the 60L Weekend price 🙂 Happy Halloween! The rest of this release features items added to the clothing line at Moon Dance Designs…one top outfit, just right for the Halloween season! Also avaliable for your Halloween parties or gift giving, is the cute Halloween Basket with Cookies…Click the basket to recieve the treat of 8 different cookies! Hi all! After a little break from SL, back building again and a few releases this week. 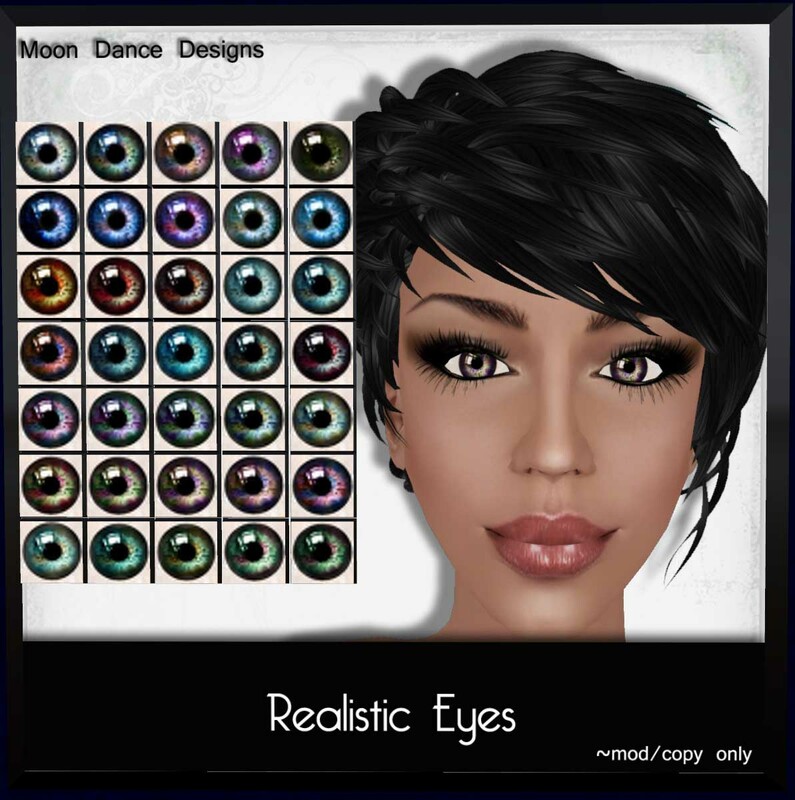 Firstly, there is a new addition to the Moon Dance Designs Salon….35 colors of Realistic Eyes. The rest of this release features items added to the clothing line at Moon Dance Designs…one outfit, just right for the Halloween season. 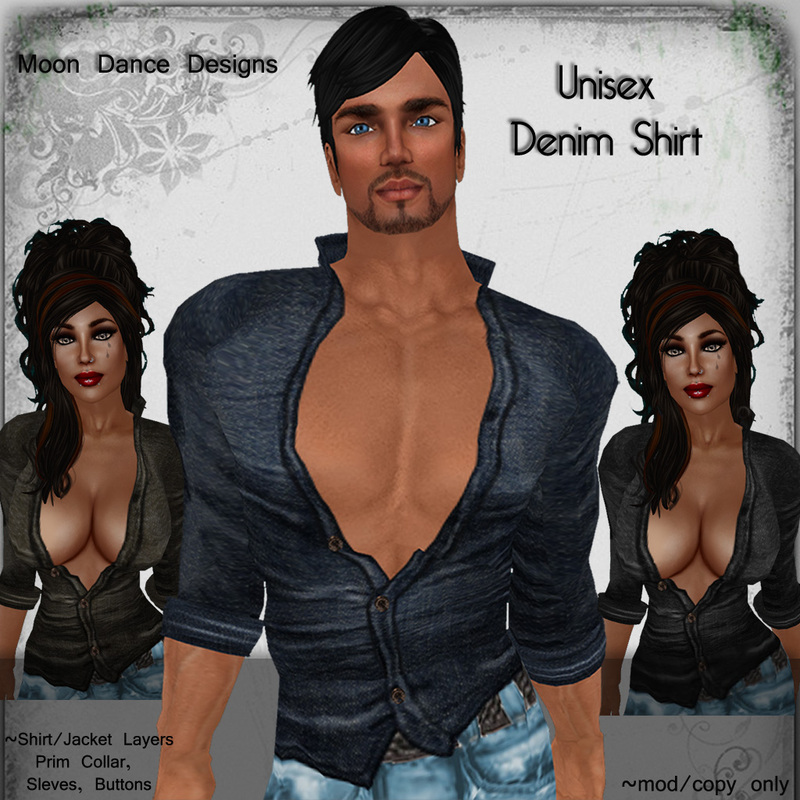 Lastly, a Unisex Denim Shirt, available in 3 colors with sculpty prim collar, cuffs and buttons.